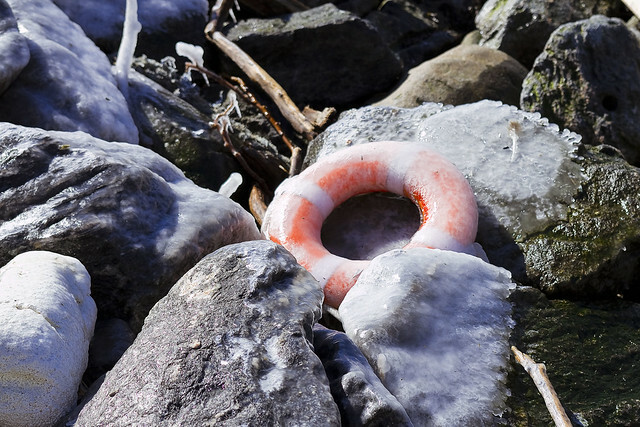 Sorry for today’s late and rather insubstantial update, depicting a life preserver frozen to the shoreline of Red Hook’s Erie Basin, which is somewhat metaphorical. Looking forward to the warmer weather this weekend, and your humble narrator will be everywhere along the Newtown Creek in the next few days, camera in hand. Additionally, next week, I’ll be announcing the 2014 Newtown Creek walking tour schedule as it currently stands. A humble narrator will be live in meatspace at Brooklyn Brainery tonight. 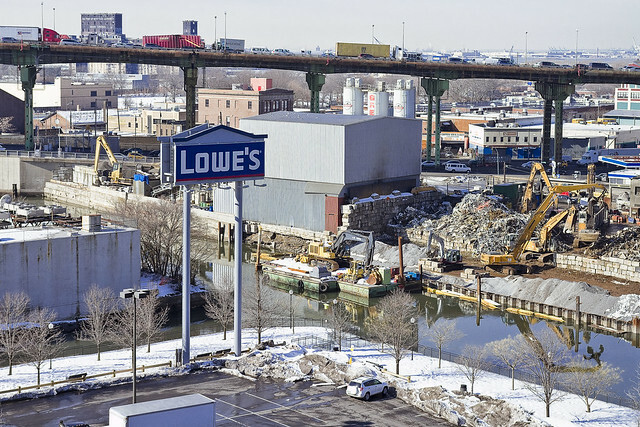 Pictured is the view from the Smith 9th street station in South Brooklyn, looking down upon the fabulous Gowanus. Business has been calling me down this way all through the end of 2013 and beginning of 2014. For the moment, at least, it appears that I’m going to be a regular visitor, so a bit of curiosity about the locale has been blooming in that withered carbuncle which beats within my chest. 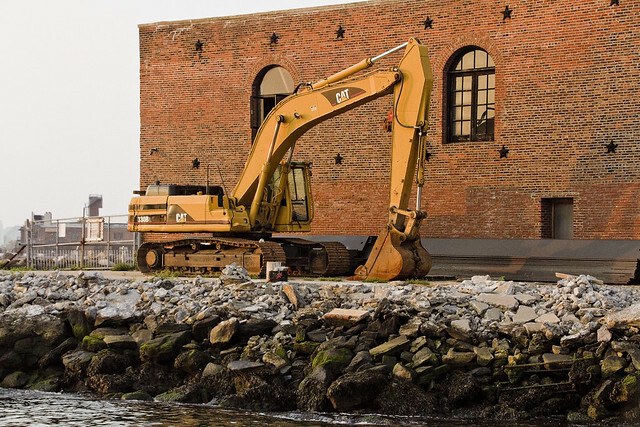 In no way do I plan on developing the intimacy with this superfund site that one enjoys with Newtown Creek, but there are things to see down here, I tell you. A point of listening to H.P. Lovecraft’s “Horror at Red Hook” is made, and a preference will be stated for the Audiorealms produced (and Wayne June narrated) reading of the unabridged text. I think that this is the Hamilton Avenue Bridge in an open position which we’re seeing here, but I might be wrong. 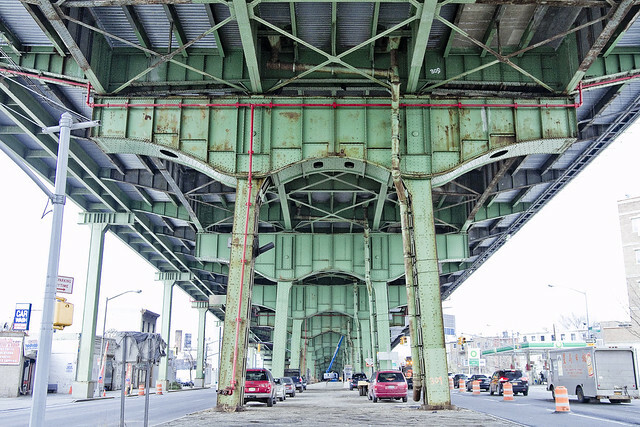 Most of my experience with this part of Brooklyn involved driving over it, via the Gowanus Expressway, on my way from the Flatlands Canarsie area to either the Battery Tunnel or one of the East River bridges. I’m not looking for one of you, lords and ladies, to fill me in. It is a curse knowing too much, and the joy of discovering something new – at least to me – has become something of a rarity these days. I’m saving the entire Bronx for future usage, for instance. I did wait around for awhile to see what sort of maritime traffic had called for the opening, but nothing appeared. One of my back burner projects, the kind that never really gets started and is seldom finished, has been to track down “Lovecraft in Brooklyn.” The fellow lived here for an interval, which by all reports he did not enjoy. As mentioned in posts last week, a couple of trips to coastal Brooklyn popped onto my schedule. 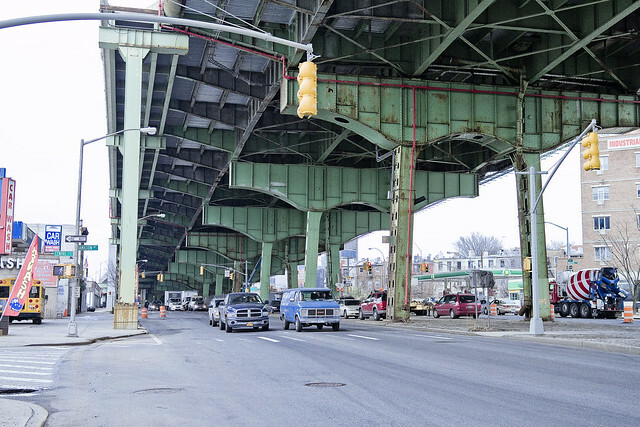 In the case of today’s post, I was in South Brooklyn at the angle found twixt Red Hook and Cobble Hill, and crossing the street beneath the extremely drippy Gowanus Expressway. 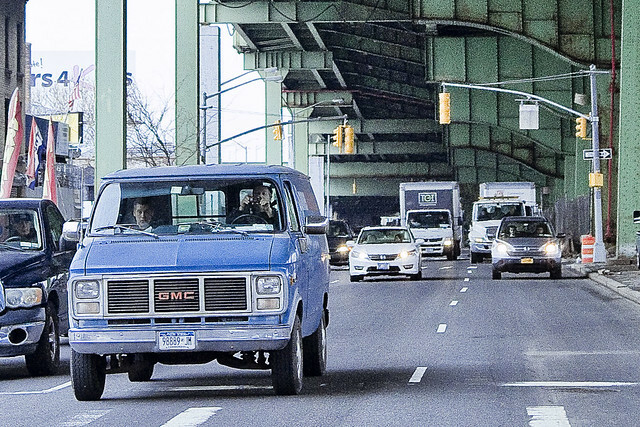 After the Verrazano Narrows Bridge, I-278 continues into Brooklyn on the Gowanus Expressway. Immediately after the bridge, the freeway comes to an eastbound exit and westbound entrance for the Belt Parkway. After this, a full interchange serves 92nd Street at which point I-278 becomes a single-level six-lane freeway. Along this road, one of the eastbound lanes serves as a high-occupancy vehicle lane. 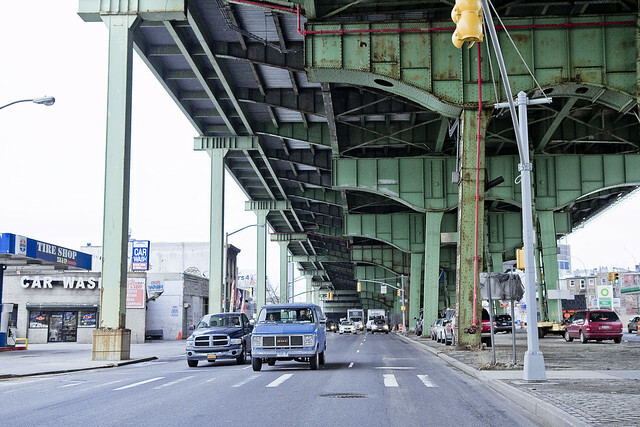 The Gowanus Expressway continues northeast into urban residential neighborhoods and reaches an eastbound interchange at Fort Hamilton Parkway and a westbound interchange at 86th Street. Turning more to the north, I-278 comes to a partial interchange at 65th Street, with an exit eastbound and entrance westbound. The road curves northwest at this point and comes to a directional interchange providing access to 3rd Avenue and the Belt Parkway. A confession, seldom do I actually pay attention to the minute details when photographing an area with which I’m not overly familiar. Instead, I go for the big shot, and use my lens at its widest angles. In the street, I have a lot to worry about – traffic, criminal underclasses and malign manifestations of the street culture, and so on. Often, when I’m at my desk and examining the shot qualitatively (focus and exposure rather than composition and esthetics etc. ), something will jump out at me. Notice the blue van, which I didn’t until I was back at HQ. …standing on a street, walkway of a bridge, sidewalk, or other pedestrian passageway while using a handheld device and not otherwise asserting exclusive use by any means, including physical or verbal, is not activity that requires a permit. So, there I stood, dirty black raincoat flapping about in the slipstream of truck and traffic and waving the camera about during a red light interval. Obviously, this registered in the mind of the driver of the blue van as suspicious activity, and he began to photograph me right back. The panopticon at work, lords and ladies, he saw something. Wonder if he said something? The 1984 scenario offered by Orwell has only come partially true in 2014. The State is indeed watching, and listening. Unfortunately, its usually “Little Brother” (as Cory Doctorow coined it) who is watching. This is all good though, as what is good for the goose is literally good for the gander, and the Brooklyn way is to keep an eye on the neighborhood. 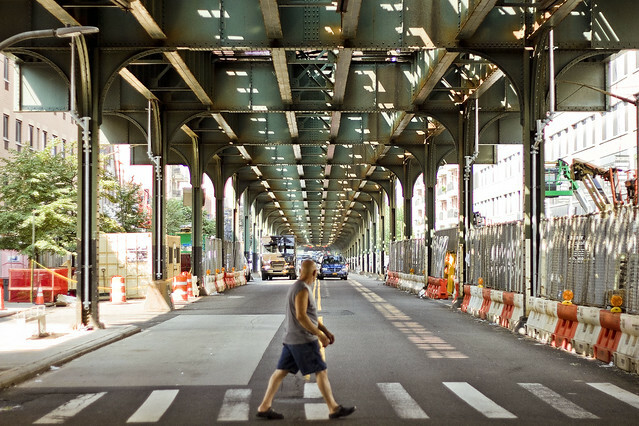 On this day, under the Gowanus Expressway, there were at least two surveillance devices active and pointing at each other. Mine and his. Mine was bigger. Big Brother is a fictional character in George Orwell’s novel Nineteen Eighty-Four. He is the enigmatic dictator of Oceania, a totalitarian state taken to its utmost logical consequence – where the ruling Party wields total power for its own sake over the inhabitants. In the society that Orwell describes, everyone is under complete surveillance by the authorities, mainly by telescreens. The people are constantly reminded of this by the phrase “Big Brother is watching you”, which is the core “truth” of the propaganda system in this state. Since the publication of Nineteen Eighty-Four, the term “Big Brother” has entered the lexicon as a synonym for abuse of government power, particularly in respect to civil liberties, often specifically related to mass surveillance. 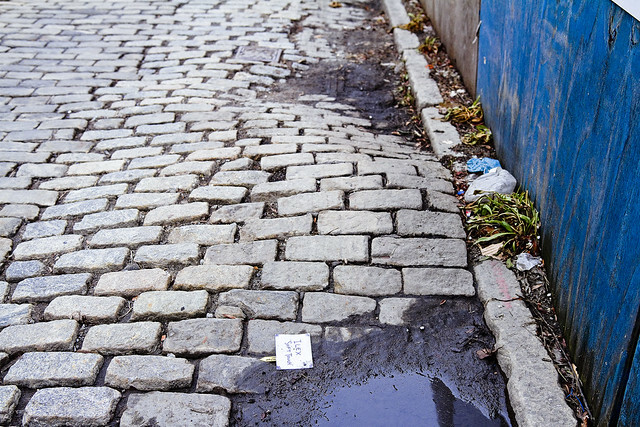 A walkabout in Red Hook, by the Gowanus. 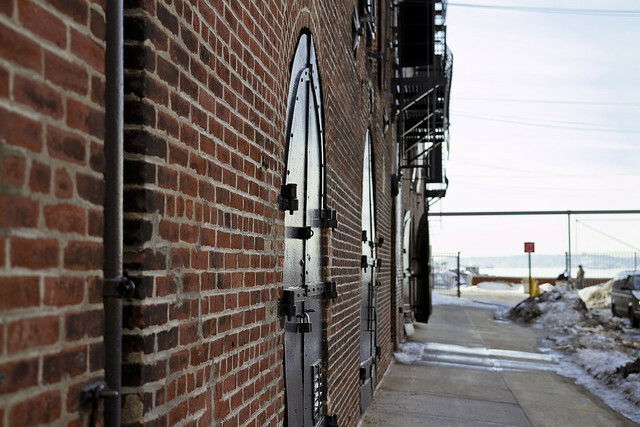 An assignment carried me out to the ancient harbor of South Brooklyn, Red Hook. After my business was concluded, a walkabout was conducted. Nothing “formal,” as I wasn’t looking for anything in particular, just poking around a bit while walking back to the train. Can’t have my beloved Creek think I’m cheating on her, especially not with her sister of the superfund. The Gowanus Canal, of which I know little. That’s something I say all the time, and I’m being a bit disingenuous. 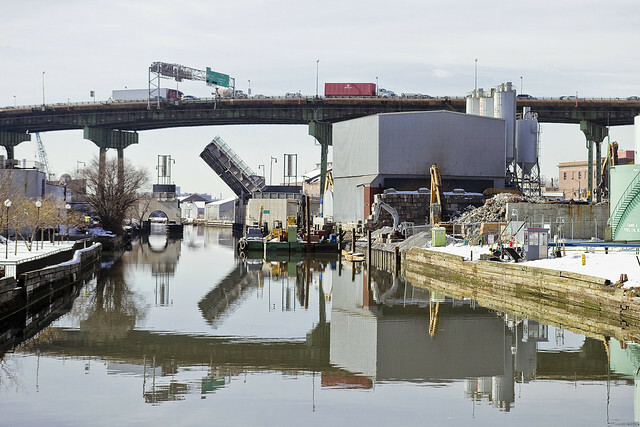 By the standards of the average person, I know a lot about Gowanus, but not enough to satisfactorily describe it. 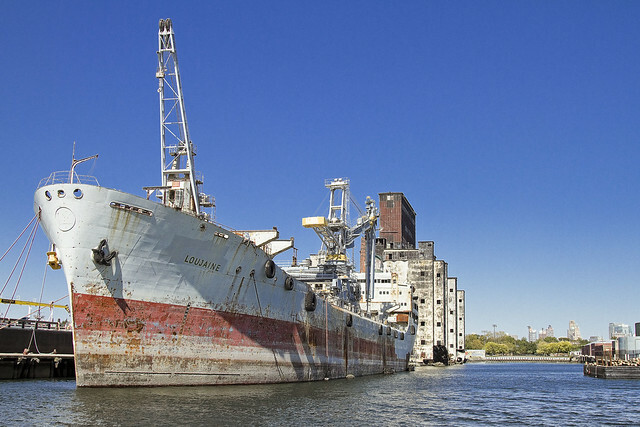 Recently, I attended a lecture by Joseph Alexiou, and that young man knows about the Gowanus. 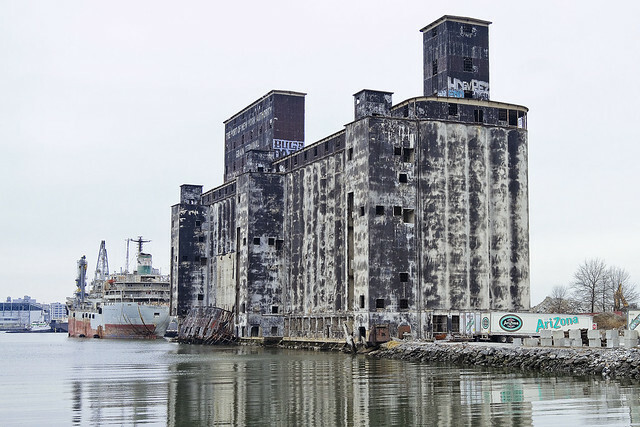 The structure pictured above was formerly a grain terminal, by the way. 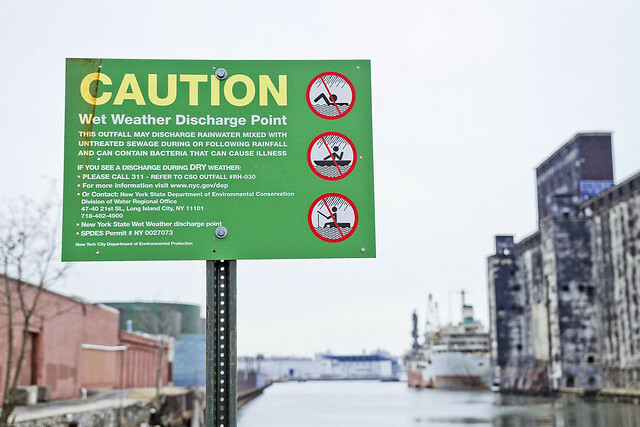 Unfortunately, much of the story here at Gowanus is the same as it is on Newtown Creek. 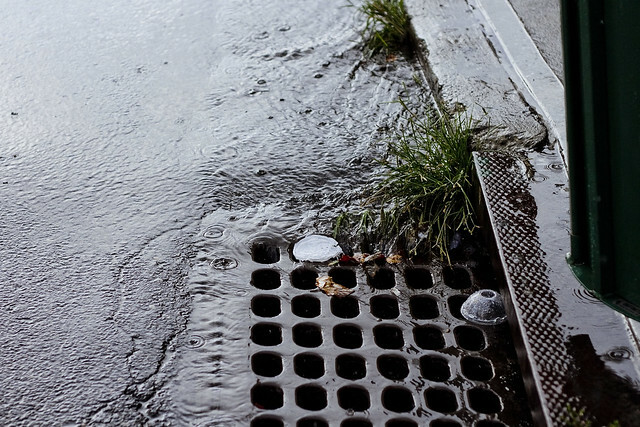 Oil companies and chemical factories and manufactured gas plants and centuries of industrial activity, coupled with the City running open sewers directly into the water. Abandon all hope, ye huddled masses. A trip to Greenwood Cemetery in Brooklyn, seeking AND FINDING the spot where Robert Suydam lays with his bride. You have no idea how much it freaks a humble narrator out when the realization that H.P. Lovecraft’s stories aren’t altogether fictional sets in.